Now that we are going into the final regional dance competition of the year, I should catch up on blogging about our season so far! 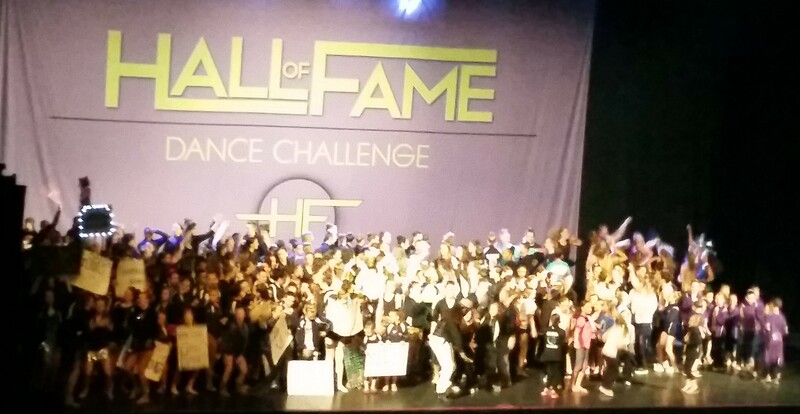 The first weekend of April, Lake Area Dance Center attended the Hall of Fame Dance Challenge. Each year, this competition seems to get bigger and longer. The competition started on Wednesday, and went through Sunday. There were two stages going, almost the entire time. One of the things I really enjoy about this competition is that they have a live stream. People who don’t want to drive downtown St. Paul and pay for parking, could still watch their teammates, grandchildren, or friends dance online. Grace didn’t have to the first few days of the competition. Since the best of the best studios in the Twin Cities tend to participate in this competition, we were pretty much glued to the Live Stream, watching all the dances! On Saturday, Lake Area Dance Center performed their production number. It was the first time I had gotten to see it. I don’t know how Miss Maria does it – putting almost 70 dancers in the same dance, all on stage at the same time for the ending! WOW! There were a couple of great dances in their category. They got a Precision Judges’ Award, 1st place platinum, and 1st overall for Teen National (intermediate) Lines! That night, Grace did her solo. She was, again, competing in the American (elite) teen tap division. She did very well. 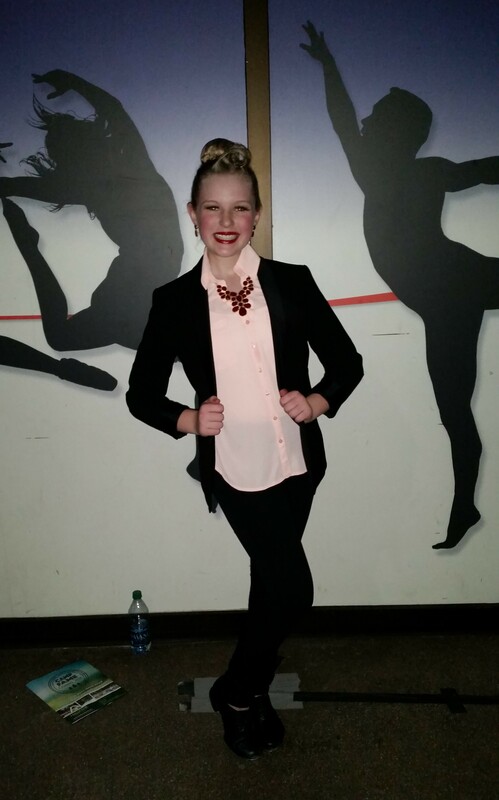 While she didn’t place in the overalls (there were 74 solos she was competing against), she got a platinum score. I was very proud of her! Sunday, Grace had her tap small group, and all 3 of her large group dances. All four dances looked fantastic! This was the first time competing at the elite level for our small and large groups. We were all nervous about how it would go. The level of dancing is extraordinary, and our girls held their own! Grace’s small group scored a platinum. 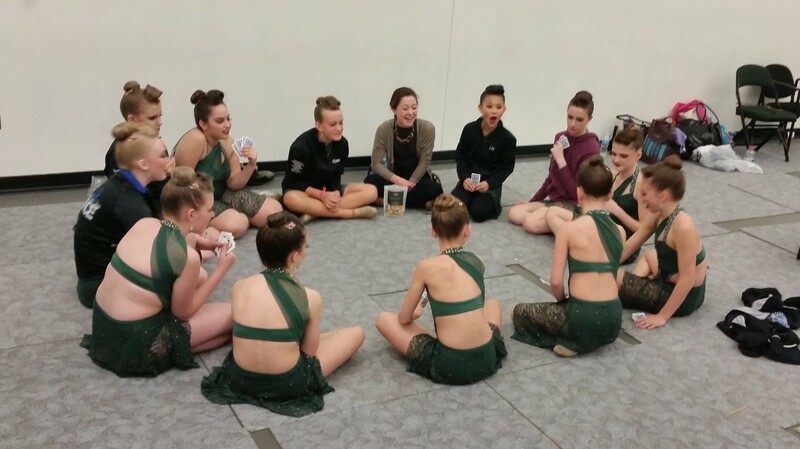 The teen tap large group got a Judges’ Award for Precision, and scored a 1st place platinum. Their lyrical dance scored a high gold (though, in my opinion, it should have been platinum). Their jazz dance scored a platinum as well. Their dances did not score in the overall top 10, but with studios such as Larkin, Northern Force, Kinkade Dance Industries, and Woodbury Dance Center as the competition, I’d say they did just fine! Grace’s 2nd cousin (or something like that), dances for Studio 4, it was fun to get to see most of her dances as well! The teens, playing cards to kill time during a long wait between small groups and large groups. There is one thing that bothers me about Hall of Fame every year. They perpetually run WAY ahead of schedule. While it’s great for the dancers, like Grace, who are scheduled to dance late at night, it’s not great for the family members who want to watch. On Saturday, they were an hour and a half ahead of schedule, and they were going out of order. Our dancers were scheduled to dance at 5:22. My husband figured he should get there at 4, “just to be safe.” He sent me a text at 4:06 saying he was waiting for the elevator at the parking garage, and would be in the auditorium soon. Our production dance was just finishing up. To say he was livid about missing it, when he was there that early, would be an understatement!! I heard several people talking about how relatives who had come to see dancers (from several studios), missed the dances they had come to see. Hall of Fame has been hosting competitions long enough, they should be able to adjust the timing in the schedules somewhat to a more realistic expectation. The saving grace, was that Cossetta’s is just down the street. We were able to have a family dinner between production and Grace’s solo. The other thing that I tend to complain about every year, is that the program does not have pages to keep track of awards on. This competition does a lot of great awards, including Best of Category, MVP, and more… it would be really nice if they gave us a place to write them all! Many parents were confused by the scoring at this competition. I remember being confused my first year or two there too… Here’s how it all worked. First, the “Leagues”: There were 3 leagues. Rookie is the same as recreational. National is the same as intermediate. American is elite. Within each of these divisions, dances were not only divided by style of dance, but also by age. Our studio has dancers at each of the different divisions. Divisions are determined mostly by the number of hours per week dancers study. Next, the adjudication. Every dance was given a score. At the beginning of each awards session, they go through each dance and give it a ranking based on a range of scores. The lowest possible score is High Silver, then Gold, then High Gold, and Platinum. In the American league (ages 9 and older) only, there is a higher score called Grand Slam. Few dances received a Grand Slam, but wow, that’s a high score (293.5-300)! Within each category (i.e Teen, Large Group, Tap, Age 13, American League), there was a 1st place winner. This is not the same as 1st overall. In order to be a category winner, a dance had to receive at least a high gold or higher. Because categories were so divided up, there were many 1st place platinums or 1st place high golds. I think this is where many people got confused. Despite the annoyances, this is still a fun competition to watch! There are so many amazing studios and dancers competing, it was well worth attending (or watching online)!